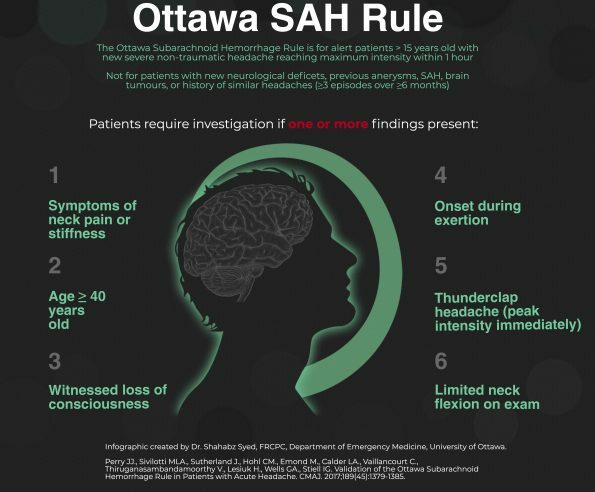 Dr. Perry and Colleagues have previously derived and validated the Ottawa SAH rule for patients with suspected subarachnoid hemorrhage, here we present the multicenter prospective validation of the rule1, with some insight on the rule from Dr. Perry himself! 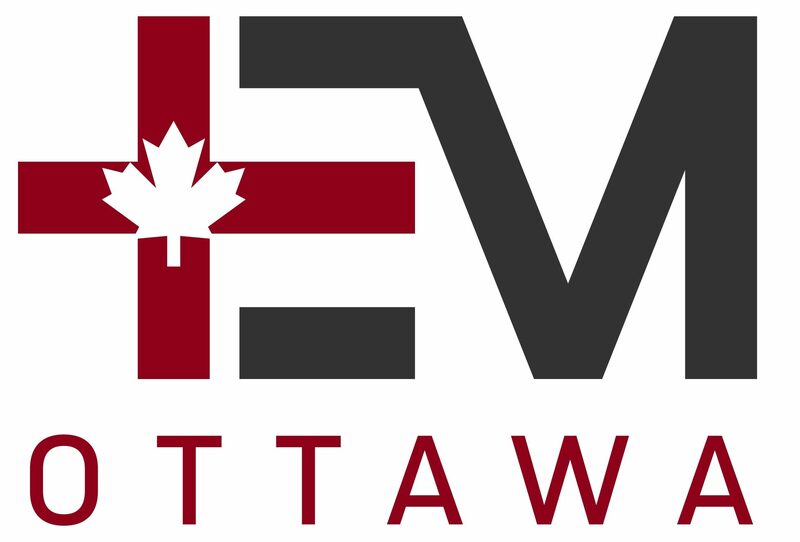 Note that the infographic included within this post is printable for use as a teaching tool in the Emergency Department. Headache accounts for about 1-2% of all emergency department visits. 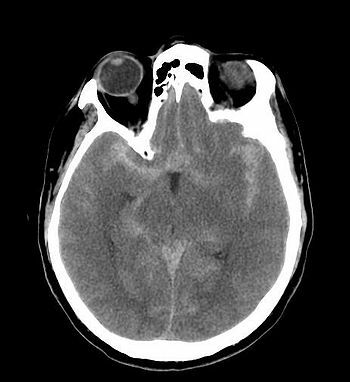 One of the most feared diagnosis within these patients is subarachnoid hemorrhage. While investigations are clearly warranted for patients with a diminished level of consciousness or new focal neurological deficits, approximately 50% of patients with subarachnoid hemorrhage (SAH) have no focal or global neurological findings. Deciding whether to image headache patients with no deficits is difficult, especially since timely diagnosis and treatment results in substantially better outcomes. This headache rule is for neurologically normal patients with a headache which peaks within 1 hour, with no trauma and are not known to have recurrent headaches (i.e. ≥3 similar headaches over a period of greater than 6 months). It is also not intended for patients with brain shunts, known brain tumors or previous SAH. Headache patients with one or more of these high risk clinical variables require investigations for SAH. We suggest that the initial test to be an unenhanced CT head. If the CT is done within 6 hours, we suggest no further testing for most patients2. The optimal method to determine if further testing is to have a shared decision with the patient and their family. The risk of SAH is less than 1% in this early imaging group. Patients deemed to be at exceptionally high risk (i.e. instant headache, age >40 and family history of SAH) may be considered for lumbar puncture (LP). CT should not be relied on in patients known to be moderate to severely anemic, as blood is not well distinguished from cerebrospinal fluid in this population. Patients presenting after 6 hours will need a LP. We have previously identified that a normal CT and normal LP completely rules out a SAH3. For LPs which are not completely normal, we have previously determined that cerebrospinal fluid results with <2000 red blood cells x 109/L and no visual xanthochromia is a low risk tap4. Unless patients are at ultra-high-risk, it is reasonable to stop investigating. We recommend CT angiography when an LP is indicated but the patient has contraindications, the patient is a late presenter (i.e. >1 week after headache onset) or they have abnormal CT or high risk LP findings. Indiscriminate CT angiography will increase the number of incidental aneurysms identified (estimated to be present in 3% of the population). Many of these may be either coiled or clipped which may cause unnecessary morbidity or mortality for an aneurysm which would never have caused them harm. Dr. Perry is an Emergency Physician and full Professor in the department of Epidemiology and Community Medicine. He has a special research interest in subarachnoid hemorrhage, TIA and stroke.